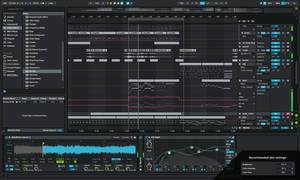 This skin is for the "Pre-2010" Steam UI Version. This skin is not compatible with the 2010 UI update for Steam. This won't show up in the new Steam's list, as the skin format has been completely overhauled. The "Pre-2010" UI Version of Steam is no longer available AFAIK. So, this skin is pretty much dead. A modified, lighter version of 's Steam skin, Carbon. 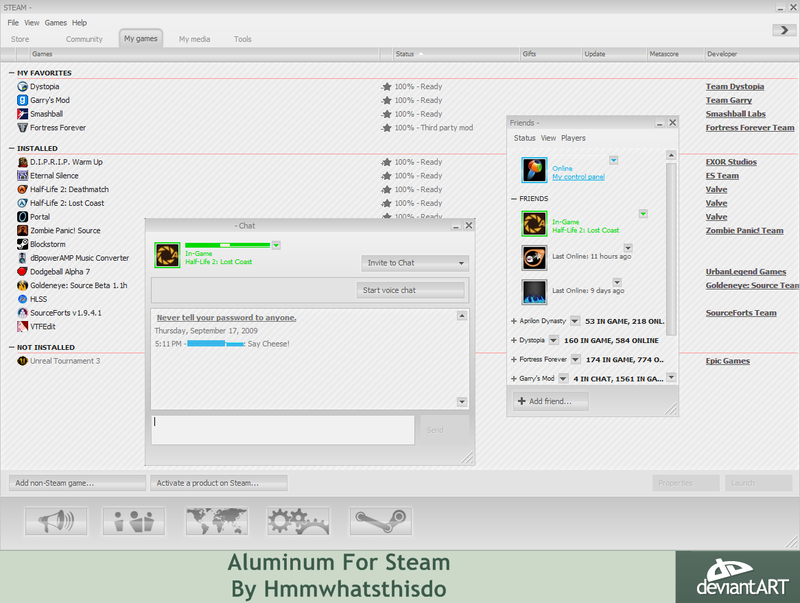 Thanks a bunch for downloading my steam skin "Aluminum". Also, many thanks to Ryan Thaut for letting me modify his skin "Carbon" to make a lighter version. Included icons, created by Vaksa ([link]), used with Ryan Thaut's permission, as Vaksa was unreachable. Valve, The Valve logo, Steam, the Steam logo, Source, the Source logo, and Valve Source are trademarks and/or registered tradmarks of Valve Corporation in the United States and other countries. Copyright hmmwhatsthisdo (The Chosen One) (2009). All rights reserved. No modification or distribution without my written permission. 2. Drag-N-Drop the "Aluminum" Folder, NOT the contents of it! 3. Go to Steam>Settings>Interface Tab>Skin>Select "Aluminum"
4. Restart Steam as it asks. If you have any questions, comments, suggestions, or requests for other skin modifications, please leave a dA comment or leave a visitor comment on my Steam Page. Uhm, it's not going to work anymore. Steam updated their UI scheme about 4-6 months ago, and the scheme needs to be completely rebuilt. Yes, but I just modified a different skin. =rthaut made Carbon for the Steam Client, and this is a version with modified textures. The skin is awesome, I love it. Hooked this up to my Steam window... nicely done.